maintenance lot at the Oakland Cailf., airport. After two hours of shooting, The gnomish director, Jerry Kauffman, was still not pleased. 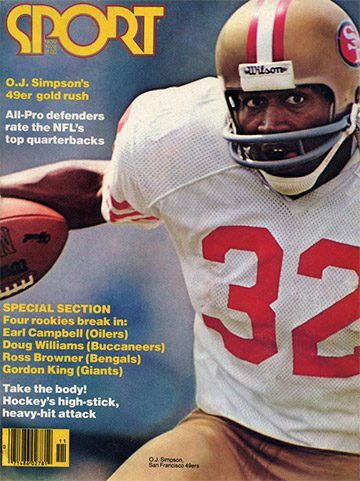 He ordered the Bay Area’s newest football hero, OJ. Simpson, back for another sprint between two rows of cars. This was Simpson’s 19th Hertz commercial in a successful ad campaign that had made the San Francisco 49ers superstar runner one or the wealthiest and most recognizable sports celebrities in the country . Simpson, wearing a gray, three-piece business suit and carrying a briefcase and overcoat, jogged about 40 yards toward the camera, with his legs pumping high in an exaggerated motion, and a happy, albeit silly grin on his face. But Kauffman wanted more, and he sent Simpson back for still another run. And another.